Sweet potato (84%), batter (modified starches (1412, 1422), acidity regulators (450, 500), dextrin, natural colours (paprika, turmeric), molasses, pea fibre, rice flour, salt, sugar, thickener (415)), vegetable oil (contains one or more of the following oils: canola, cottonseed, soybean, sunflower, corn). Made in a facility that also processes products with gluten containing cereals and milk. Preheat oven and oven tray to 230°C (210°C fan forced) for 10 minutes. 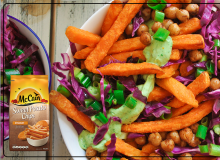 Spread McCain Sweet Potato Chips in a single layer on the preheated oven tray and place in the top half of the oven. Bake in oven for 10 minutes, turn and continue heating for a further 10 minutes until they’re lovely, crisp and light golden. Regular turning is unnecessary. NOTE: Cooking times may vary from oven to oven. Adjust the cooking time to suit your oven and preferences. Mmm…sweet potato chips. 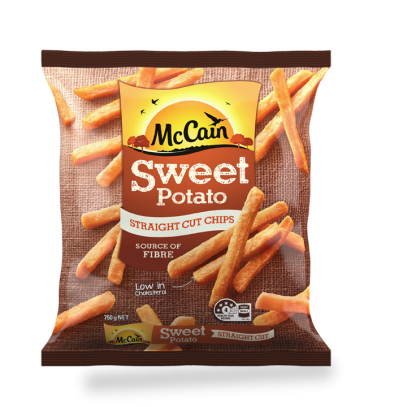 The following cooking instructions are for a full tray of McCain Sweet Potato Chips. For smaller quantities reduce the cooking time accordingly. For best results cook from frozen. Do not overcook and watch carefully during the final minutes of preparation. Derived from plants, the difference between vegetable oils and fats is that oil will remain liquid at room temperature. Vegetable oil serves many purposes in the culinary world. It is used to make shortenings, to make other ingredients stick together less, adds flavour and provide a flavour base for other ingredients.